It has been a while since I last wrote reviews on cloth diapers. This post has been in my draft for a while, did not have time to check and update it. Anyways, here it is checked an updated! BumGenius 4.0 is definitely my favourite since Baby Iqbal started eating solid food. Easier to clean than Flip. For BumGenius cloth diapers, I'll make their reviews in one entry as they do not have much differences in terms of their fit, performance and absorbency but have a slight difference in their overall value. When I heard about the new BumGenius Freetime and read reviews about it, I decided to buy one in Albert print as soon as it was available from our retailer, Bummia Kids. After that I was influence to purchase another BumGenius 4.0 pocket diaper just because they were discontinuing their artist prints and I want to compare it with the new Freetime. So I bought one in Eiffel Tower in hook and loop closure since the snaps have already long gone! 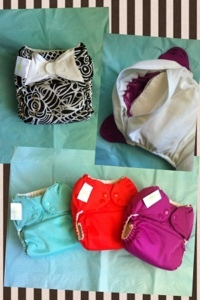 BumGenius Freetime is an all-in one one-size cloth diaper with semi-attached microfiber inserts (called them flaps). This is not the usual all-in-one which is normally regarded the same as disposable diaper instead they have flaps for quicker drying time. Each flap has 2 layers of absorbency and a layer of sewn-in insert so a total of 5 layers. Just like the name 'Freetime', this diaper does not require any stuffing so you have more time to do something else supposedly. There are issues about how to spray off poop from this diaper due to the flaps, but it does not bother me for now because Baby Iq's poop usually goes up to the back and not to the sides make it easier for me to spray them off. BumGenius 4.0 is a one-size pocket cloth diaper been around for a while now from it descendents BG 3.0 and the previous versions. This diaper is also similar to disposable diaper although we have to stuff and remove the inserts but still very easy to use when the diaper is pre-stuffed. Each diaper comes with one-size and newborn inserts - when both are being used, it also gives a total of 5 layers absorbency. It has a wide opening slot which makes it easy to stuff and remove the inserts and also a slot cover to protect babies from wetness (not my favourite feature though). BumGenius and Flip come from the same manufacturer, Cotton Babies which only means one thing, I love love their fit especially the stretchy tabs (and the same colour snaps. Irrelevant but still love!!! *wink*). They say it can fit babies from 7+ to 35 lbs (3 to 16 kgs) but it fits Iqbal when he was around 5 kgs. Both Bumgenius Freetime and 4.0 have snaps and hook & loop closures - I prefer snaps because I always have to put the H&L at the laundry tabs before and after using and I find it a hassle (worried if it will touch the inner lining). It has a 3x3 snaps down rise setting and almost 8kgs, Baby Iqbal still fits the smallest rise setting and with two or three rows of snaps visible at his waist just like Flip. As I have mentioned above, both Bumgenius 4.0 and Freetime have 5 layers of absorbency and they usually last for 3-4 hours max for Baby Iqbal. I'll always try to make sure to change Baby Iqbal right away when he poops and when I realised he has been wearing it for a almost 4 hours. I also have tried using BG 4.0 for nighttime with no leak so far. I am very satisfied with the performance of this diaper. Bumgenius 4.0 retails for $35 while Bumgenius Freetime retails at $30 each. When I have both to try, I concluded that I like Bumgenius 4.0 more than Freetime. It was a hard decision and I had been asking around and read comparisons and reviews to find out which one is the best. These are our going out diaper (or to show off diaper). BumGenius 4.0 - ordered more in the new colours!